There is no doubt that Florida is a camping paradise. 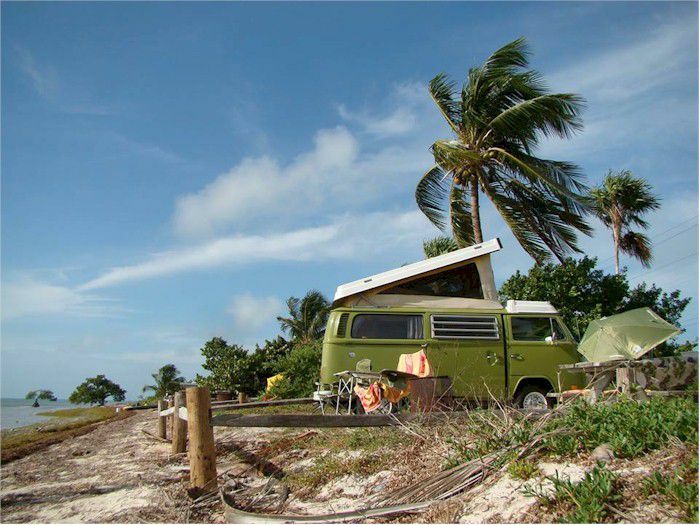 Still, while the Sunshine State's mild climate allows for year round camping and nearly unlimited outdoor activities, there are things that you should know before planning to pitch your tent or hook-up the RV at a Florida campground. First of all, if you'll be traveling to Florida for your camping vacation, you need to be aware of Florida's traffic laws. One is especially specific to those pulling camping trailers or fifth wheels. Florida requires all trailers exceeding 3,000 pounds in weight to be equipped with brakes on all wheels in accordance of Florida Motor Vehicles Code Section 316.261. Every passenger in a motor vehicle must be restrained by a safety belt or by a child restraint device, regardless of seating position. Effective June 30, 2009, Florida's "click it, or ticket" law enables law enforcement to pull over any vehicle for this violation even if there has been no other traffic offense. Florida’s “Move Over Act," passed in 2002, requires drivers to move over to the next lane or slow down (at least 20 miles below the posted speed limit) while approaching emergency vehicles that are stopped on interstate or other highways. Use a mosquito repellent. Sprays or lotions containing DEET (NN-diethyl-meta-toluamide) at a concentration of 7.5 percent to 100 percent is suggested and a 15-percent concentration is recommended for children. A great alternative and DEET-free Crocodile!® is an all-natural herbal insect repellent available directly from the manufacturer. Avon's Skin-So-Soft is a weak, short-lasting (less than 20 minutes) mosquito repellent. Permethrin, an effective pesticide, should be used on clothing only – never apply to your skin as it is a neurotoxin. Other pesky insects that may "bug" you during your Florida camping trips are ants, noseeums (a.k.a. sand fleas) and wasps. To relieve the inevitable bites that you will get, it is good to have some type of hydrocortisone "anti-itch" cream on hand in your first aid kit. Do carry an EpiPen if you are allergic to insect bites and stings and know how to contact medical personnel if needed. The types of wildlife you may encounter while camping in Florida will depend on the region of Florida, the time of year, and how remote your campground location. While camping in Florida you may see raccoons, rabbits, squirrels, snakes, tortoises, fox, skunks, alligators, and armadillos. Ppanthers and other large cats also roam Florida's forests, and some non-native species are on the prowl in Florida these days — iguana and Burmese pythons. These creepy critters are primarily a problem in South Florida. It is worth emphasizing that although many of these critters are cute, they are still wild animals and should be left alone. It is prudent to know which venomous snakes inhabit Florida. On August 1, 2009, Florida's new shoreline fishing license requirement took effect. Florida residents (except those over age 65 and under age 16) who fish in saltwater from shore or a structure affixed to shore must have a $9 shoreline fishing license or a $17 regular saltwater fishing license. The new shoreline fishing license is not available for non-residents. Regular non-resident saltwater fishing licenses are $17 for three days, $30 for seven days or $47 for one year, regardless of whether you fish from shore or a vessel. Handling fees apply when the license comes from sales agents is 50 center per license; $2.25 plus 2.5 percent of the total sale, when purchased on the Internet; and, $3.25 plus 2.5 percent of the total sale, when purchased over the phone. Other exceptions apply for those who qualify for temporary cash assistance, food stamps or Medicaid, residents who are age 65 or older and children under age 16 may all fish without a license. Active-duty military personnel may fish without a license while home on leave in Florida. Licensed fishing piers have licenses that cover everyone who fishes from them. The new shoreline fishing license requirement allows Florida residents to be excempt from a more-expensive federal registration requirement that will take effect in 2011. For more FAQs about the new shoreline fishing license visit www.myfwc.com. Hurricane season runs from June 1 through November 30, but the most active months for formation of the storms are usually August through October. Plan accordingly and make sure any camping reservations made during this time period can be easily changed or cancelled without loosing your deposit. If you are camping during hurricane season, don't trust rumors. Monitor weather broadcasts and keep a watchful eye on developing storms. If asked to evacuate, do so immediately. Florida's heat can be menacing. Use these tips to help beat the Florida heat. Also, Surviving Summer Camping in Florida offers expert tips from About.com's Camping Guide, David Sweet. While Florida's climate is mild, did know that it is possible to experience freezing temperatures during the months of December through February in Central and North Florida? You can learn more about what to expect during specific months of the year in these monthly guides to Florida's weather. They include helpful information, including average temperatures and links to 10-day forecasts for over 10 of Florida's most visited cities, as well as festivals and events.